In a bowl- Mix/ Mushroom Soup, milk, sour cream, onions, and seasonings. Grease a 9x13 glass baking dish with non-stick cooking spray. Add 1/2 of the frozen hash browns to your dish. Pour 1/2 of your soup mixture evenly on the hash browns and sprinkle with 1/2 of your shredded cheese. Add remaining hash browns to the dish. Pour all the soup mixture evenly over hash browns. 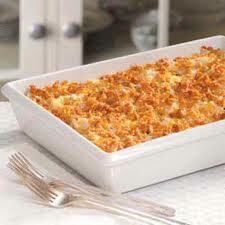 Top with cheese and crushed Cheese Nips. This versatile dish is great for many reasons. It uses mainly pantry items (I consider my fully stocked freezer an extension of my pantry). It can be prepared and refrigerated the night before, then baked and eaten the next day. It can be eaten with any meal, at any occasion. Omit Cheese Nips and top with Corn Flakes or French's Fried Onion Strings instead. Use a Pepper Jack Cheese or Garlic Havarti. The original recipe calls for Cream of Chicken Soup, I tried to make this a vegetarian version. I have tried this recipe with Cream of Broccoli or Cream of Celery too and loved it.